Former Gov. 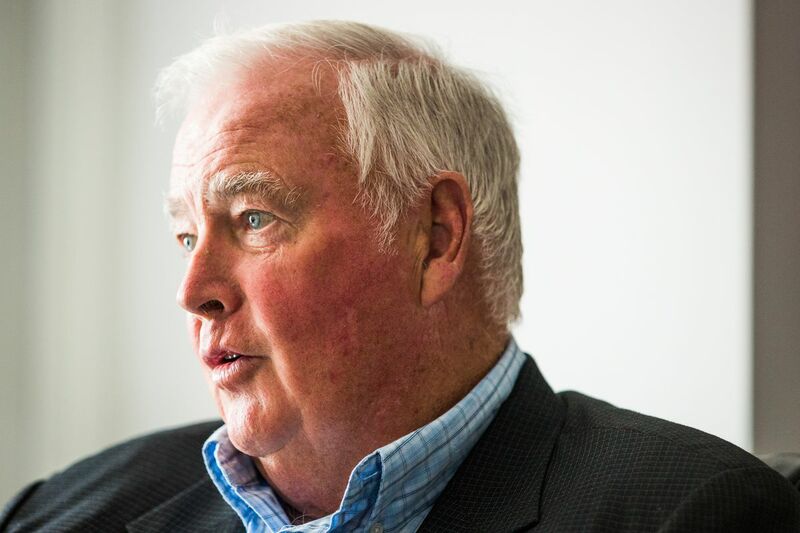 Frank Murkowski is exploring the creation of a rail connection between Alaska and Canada, an unrealized priority left over from his time in the state's highest office more than a decade ago. A contract between Murkowski and Gov. Bill Walker's office says Murkowski will serve as Walker's "special envoy" and "perform services related to establishing a rail connection between Alaska and the Canadian rail system." Except for travel reimbursement and expenses, Murkowski won't be paid for the work. The one-page contract, signed at the beginning of March by Murkowski and Walker's chief of staff, Scott Kendall, is light on details about the effort. Walker approached Murkowski about the contract, and Murkowski said it's too early to know what the cost of such a project might be. Katie Marquette, Walker's press secretary, said in an email that Murkowski "will research on the state's behalf the viability of this potential project, and report his findings back to Governor Walker and his team." A possible Alaska-Canada rail connection is something "that's been talked about for a long time," Walker said, and he's "not looking to put any money into it, just looking into what the opportunity might be." Walker said he's received questions from government officials in Canada's Alberta province in the past about the potential of, for example, bringing oil from Canada over to Alaska and putting it into the Trans-Alaska Pipeline System. "Knowing Gov. Murkowski's background on this issue," Walker said, "I thought it was good to engage him and use his expertise." Murkowski spent more than 20 years as a U.S. senator for Alaska before becoming governor in 2002. In 2005, he proposed "spending $50 million in state general funds to study the possibility of extending Alaska railroad track about 1,100 miles to connect with the Canadian railway system," according to an Anchorage Daily News article at the time. Murkowski said that amount of money wasn't appropriated for the work, though there have been studies in the past about the feasibility of linking Alaska's rail with Canada's. Now, he wants to evaluate whether it would make sense economically to build a connection that he said would be "closer to 1,500" miles. "I have been looking on this conceptually for 25 to 30 years," he said. "It's something that comes up continually. It's an opportunity to compile the existing information, look at the potential for new traffic, and see what it looks like." He suggested looking at the potential for shipping bitumen (a component of tar sands oil), minerals and other resources. Tim Sullivan, spokesman for the Alaska Railroad Corp., said his organization is always supportive of new rail and new opportunities. He wasn't aware of Murkowski's contract but said "it's encouraging. I think for all Alaskans, we look at things like this kind of growth and development as beneficial for the state." The railroad wouldn't be able to afford such a massive project on its own, Sullivan said. More than a decade ago, the Anchorage Daily News reported that Murkowski's 1,100-mile extension proposal would cost an estimated $6 billion to $8 billion. Various groups have talked with the Alaska Railroad in recent years about the possibility of connecting rail here to Canada's system, Sullivan said. Most prospects about such a connection are tied to the freight potential, he said, more than passenger use. "There's advantages both ways. Moving materials out of Alaska becomes cheaper for a lot of things, and moving materials into Alaska becomes cheaper," Sullivan said. "Most looking at it right now are talking about the idea of freight. But (passenger travel) is always a thing that is in the background or alongside it."